Charterhouse has finally released the list of nominees for the Artiste of the Decade for this year’s VGMAs. The Artiste of the Decade category has 10 nominees and they are Becca, Efya, Joe Mettle, No Tribe and Nacee, Okyeame Kwame, R2Bees, Samini, Sarkodie, Shatta Wale, and Stonebwoy. 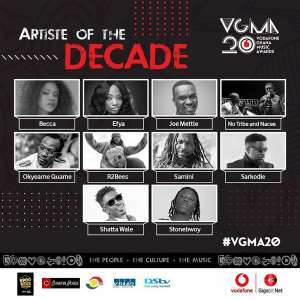 In announcing the nominees on social media, Charterhouse noted that the ten artistes have had the biggest impact, earned multiple nominations over the years in the VGMAs among other achievements. The last time this category was awarded was during 2009 Ghana Music Awards with Kojo Antwi winning the Artiste Of The Decade.